After an interesting hCG result on my blood pregnancy test, my obstetrician asked me to come in for an ultrasound. I was just six weeks pregnant, but the blood test told a different story. As soon as the ultrasound started I knew I was in for the ride of a lifetime. There were two blips on the screen – not just one. My husband asked if they were eyes and the obstetrician chuckled. Now, it appears my twins are not that special after all. I read this report from Michigan State University that claims twin births have nearly doubled between 1980 and 2009. 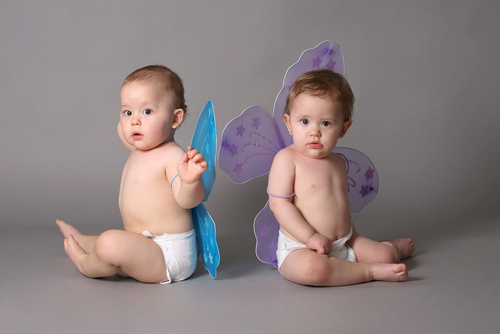 Researchers believe the increase in twin births is associated with women waiting longer to have children and the increase in availability and use of fertility treatments in the last three decades. And twins aren’t the only population on the rise. The number of triplet births nearly quadrupled during the same time period from 1 in 2,700 births to 1 in 650 births. There was clearly some concern in the publication about the increased health risks associated with multiples pregnancy, but not all women suffer complications. During my pregnancy, I went into labor at 24 weeks and was placed on bed rest for the remainder of the pregnancy. I was then hospitalized at 34 weeks for some rest before my twins were born. That rest never came as my twins were born that night. But, I once met a mother with twins who worked as a med-surge nurse up until she went into labor at 40 weeks. She played basketball, jogged daily and did yoga throughout her pregnancy – never having one complication. Do you have an experience with a twin or triplet pregnancy? Source: Barbara Luke, et al. Michigan State University. Presented at the Congress of the International Society of Twin Studies. 3 April, 2012. Previous: Should you stop smoking cold turkey during pregnancy? Next: Autism: Do We Want to Find the Cause?